Something I learned last week: Etsy + Blogger goodies = DANGEROUS FOR THE WALLET! Recently while browsing various bloggers' Instagrams I have seen the above Blog Planner notepad being featured, and while I had some time to kill while waiting for my car to be serviced last week I decided to try and find the notepad on Etsy. That was a big mistake. Not only did I end up finding the Blog Planner notepad from Heart and Arrow Design, but I found more amazing accessories and apparel for bloggers than I ever knew existed! And of course I wanted ALL OF IT. 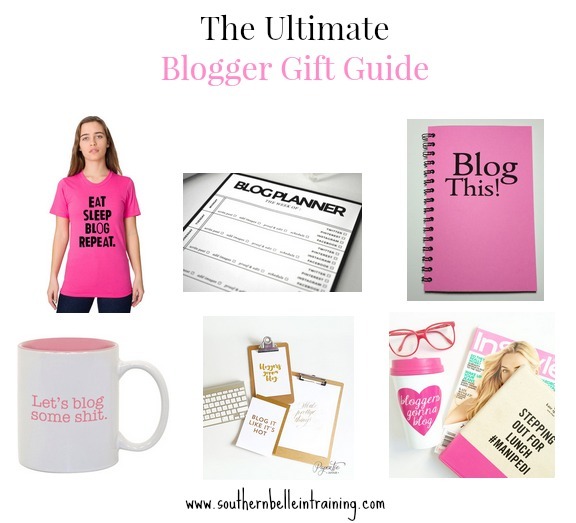 Luckily for all of you- I have rounded up all of my favorite Etsy finds into what I would like to call the "Ultimate Blogger Gift Guide." Let's start with that adorable pink t-shirt. "Eat, sleep, blog, repeat." Ummm, how accurate is this?! I know that more often that I'd like to admit this is how my days off from work in the summer look (or some lazy weekends during the school year!). Next up there are some organizational tools perfect for any blogger- fashion, lifestyle, food, fitness, faith, photography... you name it, these tools will work for bloggers of all categories! First is the handy dandy Blog Planner notepad (which is what brought me to Etsy to be looking up blog accessories in the first place!). This notepad allows you to visually plan out your posts for each week! And how cute is this little pink "Blog this!" notebook?! I know that post inspiration often hits me at the most random times, and the best way for me to remember all of my ideas is to write them down! Currently I have been writing my post ideas in the "notes" pages of my Lilly Pulitzer agenda, but a.) I'm running out of those pages, and b.) I don't carry my agenda with my everywhere in the summer months, so I really should invest in a separate notebook just for blog inspiration! The decorating concept of gallery walls is something that has just exploded in the blogging world. These two adorable prints, "Bloggers Gonna Blog" and "Blog It Like It's Hot" would just be perfect for any blogger's gallery wall, or really just for any decorating of any sort!! I know that I'll probably be ordering at least one of them for my dorm room for next year, and I'll probably head to Hobby Lobby to try and find an adorable frame to coordinate with it! And last but not least- the MUGS. Who else has an obsession with collecting adorable mugs?! (*raises my hand*) The travel mug says the same adorable quote as one of the wall prints, "Bloggers Gonna Blog." And the coffee mug... oh my word! Y'all have probably noticed that I'm not normally one to use that type of language... but just seeing this literally made me laugh out loud. I can only imagine the reaction that I would get if I carried that with me to my school library!! Girl, you just persuaded me to do some shopping! I want the coffee tumbler and the wall prints now! Haha. Hope you're enjoying France so far! Well, there goes any money in my bank account. Goodbye $$, hello Blogging Goodies! I just made the mistake of looking on Etsy for what else they have and I'm pretty sure I felt my wallet get lighter the longer I looked. These are all such cute picks! Okay, I love all of this. I am a big fan of writing down my blogging ideas in a notebook so I may just need that. Love all of these! Too cute! Etsy seriously is dangerous. All of those notepads and organizational stuff are right up my alley! I love that blog planner!